Capitalizing on a wet winter, many cover crops established very well in San Joaquin Valley vineyards this year– it has not been uncommon to see stands of barley, mustard, and other species grow taller than 3 feet in vineyard interrows. A robust cover crop planting can offer many benefits to your vineyard site. Winter cereals can break up compaction with their fibrous root systems and legumes can fix nitrogen and contribute to vine nutrition. All cover crop plant species can be used to protect the soil surface from erosion and crusting, improve water infiltration, and provide structure-building organic matter to the soil when mowed or cultivated. Plasticulture tunnels are the norm for several multimillion dollar crops such as raspberries and flowers. They are not permanent structures and are don't have to comply with the standard runoff regulations for impervious surfaces, but water running off the plastic surely ends up in post rows that become water channels. These post rows are constantly wet and are great for growing weeds. Growers with tunnels still need to comply with agricultural runoff regulations and try to manage the weeds, which can be challenging due to limited availability of effective herbicides and significant ‘organic' production (that translates to hand-weeding). 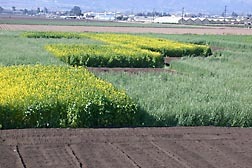 Cover crops have been/are being used as organic mulches in crop production systems in order to increase soil organic matter, improve soil structure, conserve water and reduce erosion. Cover crops can also suppress weeds by serving as a physical barrier to seedling emergence, inhibiting seed germination via reduced light transmittance, through the release of allelopathic chemicals, and by preventing herbicide loss.